If you are in a hurry and just want to find out what the best cold weather tent is, then we recommend the Luxe Tempo Single Person 4 Season Tent as the best one. 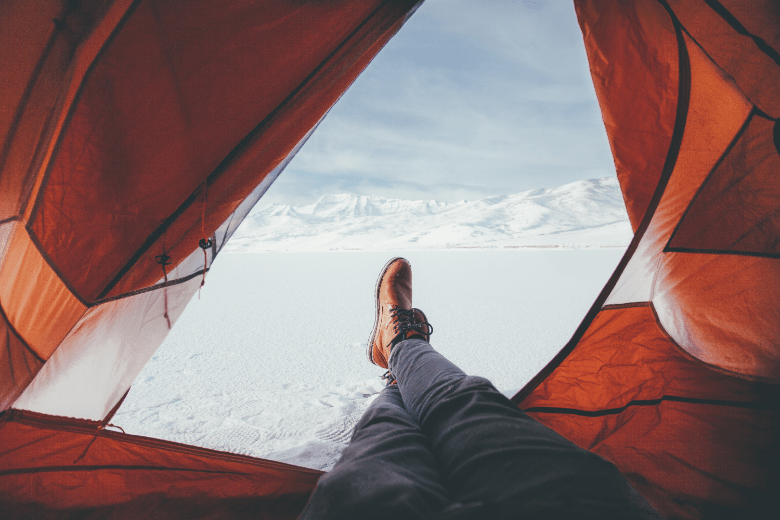 If you intend to camp in the colder months, or it’s chilly year-round at your destination, a standard tent may not offer the comfort and protection you need. After all, rain and even snow come along with the chillier weather, so you need the best cold weather tent possible to keep you warm and dry inside. What Is a Cold Weather Tent? Many tents on the market claim to keep you comfortable even in cooler temperatures. But a true cold weather tent will offer extra protection against the elements. Cold weather tents are usually heavier duty models than three-season tents. Materials may have reinforced seams, multiple layers, and additional waterproofing beyond chemical coating. Many of the materials not only keep out water but also help to insulate occupants against the cold outside. For example, nylon fabric with a silicone oil coating adds an element of waterproofing, but it also promotes wind resistance. Not all cold weather tents have the same features, but the best ones combine weatherproofing traits with heavy-duty and reliable materials for comfy camping no matter the weather. Many tents have a rating for three or even all four seasons. So why would you need a cold weather tent? Here are a few of the advantages. While your new tent may have ratings for extremely cold weather, you’ll likely be able to use it in warmer weather, too. Many cold weather tents include extra layers to protect against rain, sleet, and even allow for camping in the snow. Therefore, you’ll often find that the “base” of the tent works well for warmer weather camping. Just keep the rain fly and additional layers handy in case of bad weather. If you chill easily, what better way to stay warm than with a heavy-duty tent? After all, many cold weather tents still possess ventilation mesh, so you can peel off a few layers if it gets too warm. That means even if you spend most of your time in cooler climates, the tent truly serves through all seasons- even summer. Plus, a cold weather tent can help insulate against the outside temperatures. Even without a tent heater, you may find that the temperature inside your tent is vastly higher than the ambient temperature outdoors. Of course, this can depend on a few factors, such as how many occupants are contributing body heat, but in general, a cold weather tent will allow for a higher and more consistent indoor temperature. You also achieve peace of mind when camping in stormy or windy conditions. A tent that can hold a high capacity of snowfall means you don’t have to worry about the tent caving in. Heavy-duty materials, including poles, plus wind-resistant material means your tent won’t collapse or fly away. It will also keep you warm while the wind whips outside. Weatherproofing is nice, but it isn’t the only feature you want in a cold weather tent. Here’s what else to look for when shopping for the best cold weather option. If you’re already in a cold climate, you don’t want to spend extra time pitching a tent. It’s better to find a quick setup model that allows you to focus on other aspects of camp setup- like getting that fire going. Look for lightweight models that allow for a one-person setup, and you’ll be warm and dry faster than ever. Although it’s preferable to have a cold weather tent that keeps the elements out, you still want some means of ventilation. That’s because overnight, tents tend to generate condensation. With all the occupants’ breathing and body heat, moisture builds up on the surfaces inside. Even if it’s freezing outside, you’ll want a bit of ventilation to maintain dry conditions inside. Some cold weather tents have rain flies or other extra layers to protect against the elements, but they still allow air to circulate. In especially cold weather, you may not want a lot of extra space inside your tent. Consider whether you’ll be using a tent heater or if you have gear to stow and calculate the space accordingly. For example, a two-person tent may be enough for two people and light gear. However, if you need space for other items or you plan to use a camping heater that circulates warm air, you’ll need a bit more square footage. Many cold weather tents come with rain flies, weatherproofing covers, and even ground tarps to help make setup easier and the entire tent more efficient. Look for these “extras” to help you select the best cold weather tent. For one or two people with a bit of gear, the Geertop 2-person 4-season Backpacking Tent is a lightweight addition to a trail pack. At just over six pounds, it’s easy to stow away but still offers the full features of a four-season tent. The interior tent has two mesh windows and two doors, but with the outer layer of water- and UV-resistant polyester, you can preserve the internal temperature easily. The two entrances with dual vestibules are helpful for access, but the vestibules are a bit on the small side- not room for more than a pair of hiking boots and a few small items. Still, once you put on the exterior cover, the interior is waterproof and windproof even in below zero temperatures. Looking to fit more than one or two occupants plus gear? The MoKo Waterproof Family Camping Tent is a cabin-style tent with a 52” center height and suggests a 3-person capacity. But at just under six pounds, the tent is still easily packable. You may not be able to fit three occupants, especially if you’re packing gear, but the spacious vestibule is a perk for keeping stuff out of the elements. The floor and rain fly are material that’s flame retardant and thick, protecting you from more than one of nature’s dangers. Overall, the tent is versatile and waterproof, but the amount of ventilation from the door and windows may mean it’s difficult to maintain warmer temperatures without extra layers or a heater. Another four-season tent with a full coverage outer layer, the Terra Hiker 2 Person 4 Seasons Tent uses a breathable mesh inner tent plus a rain fly that’s 20D nylon fabric. One side of the fabric has a silicon oil coat, making it more waterproof and windproof, too. Setup is simple thanks to color-coded poles and pockets, and the manufacturer claims it only takes two minutes. Plus, the whole package weighs in at under five pounds, so it’s lightweight and portable. One potential drawback is the watertight function of the outer cover, however. With the second layer on, occupants may find it difficult to ventilate the tent. While you don’t want doors or windows open letting in water, snow, or cold air, a bit of ventilation is necessary to maintain the right humidity. For a solo traveler, the Lux Tempo Single Person 4 Season Tent offers plenty of features in a streamlined package. Its overall weight is barely four pounds, making it ideal for trail camping or bringing along for water travel. A silicone coat on the rain fly helps the tent shed water and even snow, but you can still ventilate it from the inside with the rain fly on. Double doors plus vestibules make it easier to get in and out, and the mesh panels of the doors only open from the inside. This offers solo travelers especially a bit more security. Setup is thankfully straightforward, and the package includes a ground cover to protect the underside of the tent and add another layer of weatherproofing. Another lightweight four season tent contender, the Flytop 2-Person Backpacking Tent weighs in at under six pounds and can help you thrive through winter camping. The rain fly features a snow skirt so you can have full insulation against the elements. Though the rain fly is full coverage, there are also two ventilation windows so you can still achieve air circulation even in the rain. Plus, the front of the fly rolls up, so you can create an awning if you prop the ends of the fabric up. The interior vestibule can house a bit of gear, but you may find it difficult to fit even two people plus gear in the interior square footage of this tent. Odds are, you aren’t planning on taking the whole family out for cold-weather camping. If that’s the case, then the Luxe Tempo Single Person 4 Season Tent is the best cold weather tent for the job. Its slight size makes it easy to pack whether you’re hiking, kayaking, or even traveling via motorcycle. The silicone coating on this tent helps keep rain and snow off, but you can still ventilate it with the rain fly on- a helpful perk for keeping condensation at bay. Two vestibules give extra square footage for storing gear, too, so you can rest easy without snuggling up against your dirty hiking boots or trail pack.